The Professional Doctorate in Engineering (PDEng) is equivalent in level to a PhD but more vocationally oriented. The traditional PhD requires a contribution to scientific knowledge. In contrast, the Professional Doctorate requires a contribution to professional practice. Rather than one lengthy academically-oriented PhD research project, the Professional Doctorate programme involves solving a significant organizational problem, typically based on the candidate’s work environment. Many countries are now moving towards the professional doctorate route, notably in Scandinavia. This reflects the growing desire for up-skilling and life-long learning in the modern workplace. These global players are complemented by a vibrant and thriving indigenous company base which is highly export-oriented, and one which boasts many leading players in their market sectors. A useful metric which indicates the excellence of the work being done in Ireland is that of the Shingo Prize. This is recognized worldwide as a symbol of enterprise excellence. Since 2010, only 13 organisations have been awarded the Shingo Prize, and 3 of these have been in Ireland. These firms are operating at the cutting-edge; they stay competitive by ensuring that their employees are highly skilled and highly educated. Many of them are already at Masters level. The Professional Doctorate represents a natural progression, it offers an opportunity achieve a Doctoral degree by addressing truly challenging industry problems and making a significant contribution to companies and Irish industry. Minimum requirements for a PDEng would typically be a 2.1 honours degree in a relevant area as defined in Section 5.4 of the handbook of academic regulations and procedures. This also facilitates recognition of prior learning (RPL) and would recognise candidates with a lower qualification provided they have considerable industrial experience, and evidence of the ability to study at Masters level or above. Research-based patents or peer-reviewed publications would also be recognised. Students in this category may be required to complete MQ5000. Also, modules taken under the auspices of the Engineers Ireland and the Irish Computer Society CPD programs could be accumulated to meet entry criteria. Examples of such modules are listed in Table 1. Table 1: Example Professional Accreditation Courses. You can see more about fees here. The PDEng program differs from traditional PhD programs in three important aspects: context, contact and content. The traditional PhD program focuses on preparing candidates for an academic career, and is thus focused on training people to rigorously address scientific problems which can result in a contribution to knowledge that can be published in the peer-reviewed scientific literature. In contrast, the context for this PDEng program is the practitioner workplace and the focus is on solving real-world problems faced in the daily work-place. The scope of these problems can be sufficiently large to be addressed in a significant piece of research planned and conducted over a period of time and which can ultimately result in an PDEng award. Traditional PhD programs, if they do include a taught component, place this taught component early in the cycle, a common approach being the 1+3 model with a taught component in year 1 and project work/thesis component in the following three years. In the PDEng model, contact is in more practitioner friendly blocks. These contact components fulfil a critical research socialisation aspect for candidates and thus rather than all taking place at the beginning of the cycle, these contact components are repeated in each year of the program. The design of many educational programs follows a content-based approach as material is packaged into individual courses delivered and assessed in relative isolation from each other. Bowden (2004) proposed a radically different approach based more holistically on the capabilities a candidate would achieve at the end of the program. The approach has been used successfully in curriculum design in the software area . 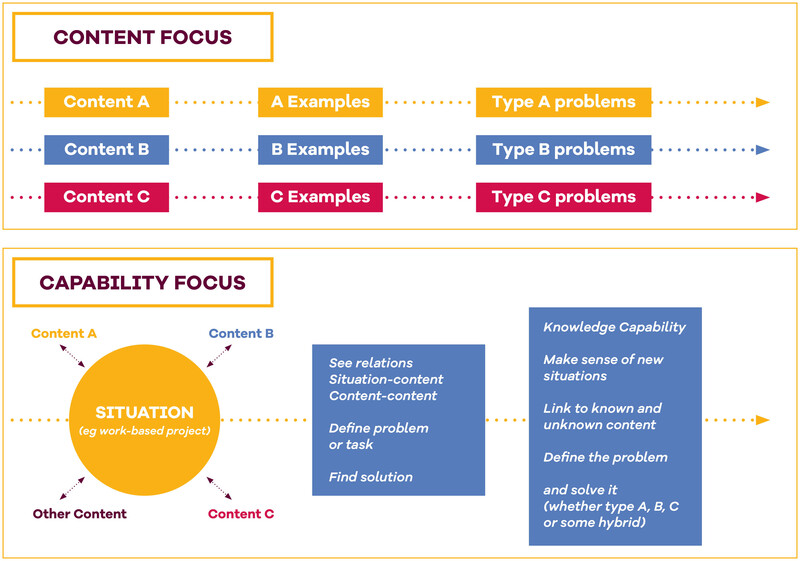 The difference between the content-based and capability-based approaches to curriculum design is represented in Figure 1 below. Increase candidate ability in relation to carrying out software and enterprise excellence related R&D innovation work relevant to a commercial setting. Understand how to rigorously achieve this innovation and communicate it successfully to different stakeholders. This leads to a different type of research approach in which design science (e.g. building an artefact) or action research (e.g. solving an actual real-world problem) are paramount as rigorous research approaches, rather than the traditional neutral and passive observer models. The program begins with a Qualifier module which assesses the capability of the candidate to construct a research proposal. On successful completion of this module, candidates will take specialised courses on a block release format (Friday afternoons and all day Saturday). We envisage six such formal sessions per year with additional online access to material and course-work. Details of the program are provided in Table 2 below. The programme begins with a qualifier modulem Personal Professional Portfolio (9 ECTS), students must successfully complete this module before qualifying for the Professional Doctorate. The Personal Professional Portfolio requires students to attend a one day workshop on Friday 30th September. During this workshop students will gain the information and skills they need to write a Research Proposal. The Research Proposal must be submitted by Friday 11th November. Students will be admitted to the Professional Doctorate based on the quality of this proposal. If you have any question, please don't hesitate to call and we would be happy to help. Click on the link bellow to download our brochure on the course details. Click on the link bellow to start your application process.